Chocolate and orange flavours go so well together, everyone knows that and I must admit it’s one of our favorite combos, like in this Death by Chocolate cake or ice cream dessert with Madeira Cake & Grand Marnier we made in the past. This is modified version of our classic zebra cake recipe that we have baked more than couple of times in the last weeks. It’s our family favorite at the moment, therefore I made it when my sister Jola was visiting and then again when our friends Sylwia & Dan visited with Asha who came all the way from India… you can read more about her journey on Sylwia’s blog. Line baking tins with paper and brush with some of the melted butter. In one bowl beat the egg whites until stiff and leave aside. In second bowl place dry ingredients: flour, baking powder, sugar. Do not add cocoa powder yet. In small mixing bowl mix butter, oil, egg yolks, juice, vanilla extract, orange extract and zest, if using. Add them gradually to the bowl with dry ingredients and mix until well combined. Add also previously whisked egg whites. Move half of the dough into another bowl (same size) to combine with cocoa powder. If it is too thick (comparing to the yellow batter)… add a bit more juice. Leave the remaining half uncoloured. Pour some of the yellow cake batter into middle of each tin, then top with brown batter making sure it is more or less the same amount and it’s poured into the middle. Repeat those steps until no more batter is left. Bake for about 60 minutes. Check with the skewer if the middle of the cake is ready. Let them cool down completely before sharing. Makes 2 large cakes / 20 – 24 servings. When pouring batter into the tins, use smaller portions of each colour for thinner stripes. This cake stores quite well, especially when wrapped in cling film or aluminum foil to prevent drying out. It is perfect for all kinds of occasions: picnics, kids’ parties, lunchboxes or simply to have a slice before bedtime with a cup of milk. For more chocolate and orange flavoured recipes take a look at Emily’s Chocolate Orange Macarons, Elizabeth’s Chocolate Orange Camp-fire Cake, Raw Chocolate Clementine Cheesecake, White Chocolate and Clementine Bombe, Helen’s Terry’s Chocolate Orange Brownies or Choclette’s Cardamom & Orange Chocolate Cupcakes. I’m adding this to the Inheritance Recipes link-up that we co-host together with Solange of Pebble Soup. 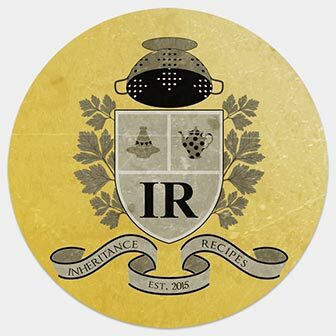 May / June Inheritance Recipes is hosted by us, please come and join us, share your inherited recipes!